Lance may be getting a little more attention than he wants from this bike, the Trek Madone he rode in the final stage of the 2009 Tour de France. Ã‚Â Designed by controversial artist Damien Hirst, the butterfly wings on it are real, and this has animal rights activists up in arms. This bike, along with the other custom designed frames (See Exhibits A,Ã‚Â B,Ã‚Â C,Ã‚Â D, E and F) are on exhibit at Stages09 through mid-August. Ã‚Â They will be auctioned off in October to raise money for Livestrong’s anti-cancer programs. This isn’t Hirst’s first occurrence of shocking people’s sensibilities. Ã‚Â In 1992 he suspended a full size shark in formaldehyde, followed by his diamond-encrusted human skull. Hirst's "The Physical Impossibility of Death" shark art. 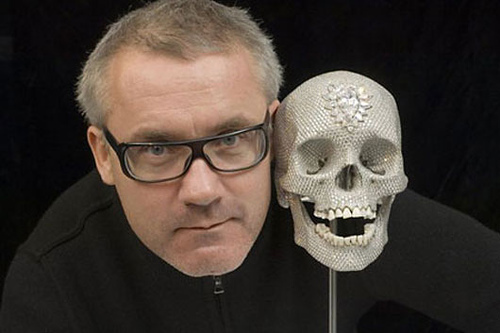 The big-headed artist with his subject, the diamond-encrusted skull art. what’s wrong with using the wings of dead butterflies? People have been doing this for centuries with jewelry, stationery and all sorts of things. PETA needs to stay focused on helping things that NEED their help. If I was Armstrong I would be ashamed to be associated with such a sick individual as Hirst. But then again, Armstrong had no problem schooming it up at photo ops with war criminal George W Bush. I am going to start an organization called PN2GAC. People Need To Get A Clue. Has it really come to this? Really? Now DEAD bugs need to be protected? After reading Hart’s comment, I can see why it didn’t leave a last name. I bet you don’t even HUG trees for fear that you might make them uncomfortable with your advances. “We now return you to regularly scheduled reality- try and keep up”. People (the protesters)….. get over yourselves…. PLEASE! If you’ve got an issue with things going on with the world, do something REAL about it. Granted, if it were live butterflies, it might be considered bad for many. However, they’re F-in dead. To me, when I’m dead, anyone can take pretty much whatever they want off my corpse as long as it helps other people. Live what you believe man! I don’t know a thing about Hirst, but I do know peta. They’re attention whores, whose sole purpose is to drum up their own namesake over every ridiculous thing they can. They constantly send out letters to every imaginable cause (remember when they sent out one to Pet Shop Boys trying to get them to change their name because it contained the word “pet?”), just hoping they get a bite. The media really should learn to just ignore them. It’s about money, not animals. If it’s high profile and mentions anything animal (or insect) related, expect a letter or phone call from these parasites. Dear PETA: Butterflies live for a matter of days or weeks. When I’m done with this carcass I hope someone can find a good use for it. Even if it’s just to fertilize the daisies. if anyone did a small amount of research, you may have found out that these are freshly emerged butterflies and are killed for the “artwork.” so yes, they are dead, because of hirst and the people who pay him. i wonder where he got that white horse.